Sintering vacuum furnace occurs simultaneously with pressing in the hot pressing processes (hot isostatic pressing, hot die pressing). 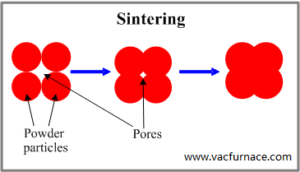 Sintering process may be conducted in different atmospheres: air, inert atmosphere, Powder metallurgy,reducing atmosphere (containing Hydrogen or carbon monoxide) or in vacuum. Decrease of the porosity, caused by the sintering process, is determined by the level of the initial porosity of the “green” compact, sintering temperature and time. the base metal (for example in copper-lead-tin bearing alloys).